Are you getting the most from your inbound digital marketing strategy? 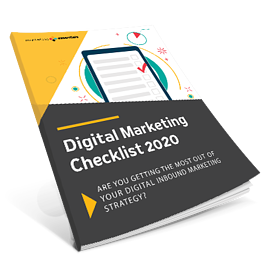 In a matter of minutes, uncover the strengths and weaknesses in your digital program using our Digital Marketing Checklist. Do your digital marketing goals accurately align with sales goals and broader company goals? Are you using email automation to the highest level of efficiency? Do you know which acquisition sources generate the most leads (organic, social, referral, direct, PPC)? Are your properly nurturing MQLs (marketing qualified leads) to SQLs (sales qualified leads) through your digital channels? Do you have the proper data reports and ROI to share with upper management? Are you missing the most effective strategies in 2019? Get 50+ questions designed to help you uncover where opportunity exist.